In early twentieth century, Professor Vilém Sallač managed to create a collection of international importance, which includes deer antlers and bovid horns from all over the world. One of the rarest items included in the collection are the antlers of Schomburgk’s deer, which lived in Thailand and became extinct in the first half of the twentieth century. Very valuable are also the antlers of South American deer, such as huemul, pudú, brockets, the marsh deer, and the pampas deer. 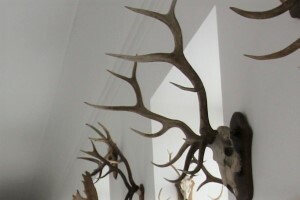 The collection includes 400 items, of which 430 are deer antlers and 60 are bovid horns. The new exposition presents all species and sub-species of deer included in the collection and a sample of 6 species of bovid horns; a total of 77 exhibits. The exhibited antlers and horns are accompanied by plaques with colour photographs of the living animals, their description and map of their range. This new exposition was completed in 2013 and the project was supported by the Forests of the Czech Republic, a state enterprise.